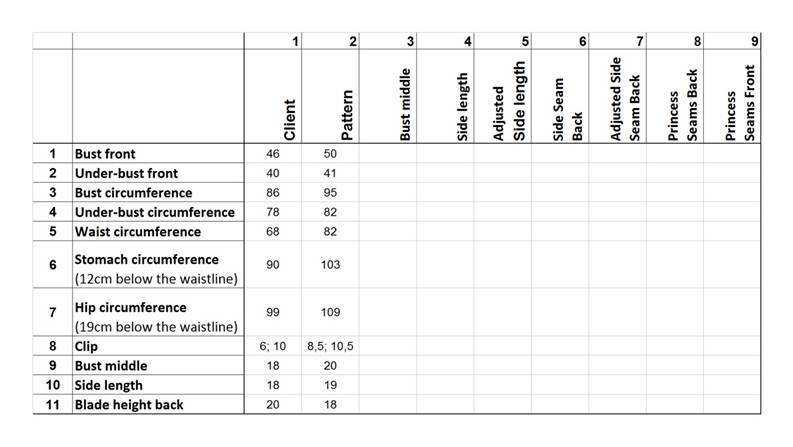 I need to customize the standard pattern after my client's measurements. I draw a table on the writing board. There are nine columns and the number of lines corresponds with the number of required measurements. - Clip. I have taken two clip measurements for this dress: toward the neckline and toward the armscye. - Bust middle. It is the distance between the supposed princess seams. - Blade height back. This additional measurement indicates maximum possible length of the back of the dress: so you can cover up as much as possible and at the same time avoid that annoying problem when the skin bulges over the top edge of the dress in the shoulder blade area. Column 1 contains all measurements I took off my client, and column 2 – all measurements taken off the mock-up. Bust middle: my client’s measurement is 18cm and it is 20cm on the pattern. It means I need to remove 1cm from either side of the central front piece. I will simply shift the central front piece 1cm inwards from the fabric fold line to make it smaller. I write -1cm in line 9 of column 3. I also write -1cm in all lines of column 3 that refer to circumferences and are affected by this alteration. Side length: my client’s measurement is 18cm and it is 20cm on the pattern. Therefore, I need to shorten the side line by 1cm at the top. I write -1cm in line 10 of column 4. Blade height back: my client’s measurement is 20cm and it is 18cm on the pattern. It means my client's shoulder blade line is located 2cm higher than the top edge of the back of the dress on the pattern. In other words, I cannot raise the back of the dress by more than 2cm. But I am not planning to raise the back of this particular dress anyway: it will be straight-cut and even somewhat low. This measurement has shown me everything I need to know but it is not involved in any calculations. I start by determining the configuration of the side seam line on the custom pattern taking into account all adjustments related to the center of the chest. The configuration of the side seam line on the front half of the dress is determined by two measurements: bust front and under-bust front. Bust front measurement: it is 46cm on the client and 50cm on the pattern. But I have already adjusted it down by 1cm from either side at the bust line level, i.e. a total of 2cm. I divide it in half (for the left and the right side of the front). As the result, I need to narrow the front down by 1cm from either side at the bust-line level to position the side seam correctly on my client's body. I write -1cm in line 1 of column 4. Under-bust front measurement: it is 40cm on the client and 41cm on the pattern. But I have narrowed the central front piece by 1cm from each side at the under-bust level. I divide it in half (for the left and the right side of the front). As the result, I need to narrow the front down by 0.5cm from either side at the under-bust level to put the side seam in place. I write -0.5cm in line 2 of column 4. Now I know the two major adjustment values which I need to analyze. Based on this analysis, I will choose a fixed value by which I will narrow or expand the standard pattern of the front. If you carefully study the measurements along the entire side seam line of the front half of the dress, you will notice that the pattern measurements are a lot bigger than the client's measurements. It is therefore logical to assume that I need to make the standard pattern smaller along all circumferences. The resulting alteration values of -1cm and +0.5cm tell me that it makes sense to shift the entire side seam line of the front 1cm inwards. I write -1cm into line 7 of column 4. Of course, all adjustment values will be more precise after I double-check the configuration of the side seam line of the front half of the dress. Clip toward the neckline: it is 6cm on the client and 8.5cm on the pattern. This part of the clip (the distance from the apex of the breast to the middle of the neckline) refers to the central front piece which I am supposed to narrow down by 1cm from either side. As you can see, I need to shorten the clip-toward-neckline by 1.5cm. I write -1.5cm in line 8 of column 4. When working on the pattern, I prefer to mark the clip at its full length with a seam allowance included rather than mark the adjusted value. Clip toward the armscye: it is 10cm on the client and 10.5cm on the pattern. I need to shorten the clip-toward-armscye by 0.5cm. I write -0.5cm in line 8 of column 4. Side length and blade height back measurements are not involved in these calculations. I move on to the configuration of the side seam line of the back half of the dress. First I pre-calculate it and write all values in the Side Seam Back column (column 6). Let us begin. I’ll see what happens if I take into account all measurements and calculations already recorded in the table. The bust front and the under-bust front measurements are not involved in the calculations. I write dashes in the table. And I move to the bust circumference. It is 86cm on the client and 95cm on the pattern. But I have already narrowed the center of the front by 1cm from either side (2cm total) and shifted the side seam line of the front 1cm inwards (2cm total). If I sum it up, it turns out that I have reduced the standard pattern by 4cm at the bust line level. Moreover, I have already removed the same value of 4cm along the entire length of the back. As you can see, there are five extra centimeters on the pattern. I need to divide them between the two sides of the back (left and right). As the result, I need to adjust down the pattern of the back by 2.5cm at the bust line level. I write -2.5cm in the table. The next measurement is the under-bust circumference: 78cm on the client and 82cm on the pattern. I have arrived at my client's measurement. It means I shouldn’t shift the side seam line of the back half of the dress at the under-bust level or else I won't meet my client's measurement. I write a zero in the table. Waist circumference: my client’s measurement is 68cm and it is 82cm on the pattern. There is an excess of ten centimeters on the pattern and I need to distribute it between the left and the right side of the back. In other words, I need to shift either side of the back 5cm inwards at the waistline level to arrive at my client's measurement. I write -5cm in the table. Let's move to the stomach circumference. My client’s measurement is 90cm and it is 103cm on the pattern. I divide the value in half. As the result, I need to shift either side of the back 4.5cm inwards at the level of the stomach line (12cm below the waistline). I write -4.5cm in the table. I reach the hip line (19 cm below the waistline) , i.e. the hip circumference. It is 99cm on the client and 109cm on the pattern. I divide the value in half. As the result, I need to shift either side of the back 3cm inwards at the level of the hip line. I write -3cm in the table. Clip, bust middle, and blade height back are not involved in the calculations. The side length measurement is adjusted the same way as on the front half of the dress. After studying the measurements along the entire side seam line of the back, I have arrived at a quite logical decision: to reduce the bust circumferences, the waist, the stomach, and the hip circumferences of the standard pattern by 2.5cm each. I will use the front and the back princess seams to narrow it additionally in the waist, stomach, and hips. I write -2.5cm in the Adjusted Side Seam Back column (lines 3, 5, 6, and 7 of column 7). What am I supposed to do with the side seam at the under-bust level? It follows from the calculations that I shouldn't touch it because I have already adjusted it after my client's measurement. If I do make the standard pattern 2.5cm smaller, I will have to shift the back princess seams outwards by the same value (applying changes to the front princess seams in the area below the waistline is strictly forbidden!). In this case, I will have to shift each princess seam at the back about as much as 0.5cm outwards at the under-bust level. It is quite a lot. It calls for an obvious conclusion: I should shift inwards the side seam line of the back at the under-bust level by a smaller value which will be easier to compensate for by shifting outwards the princess seams at the back. Instead of 2.5cm, I have decided to shift the side seam line of the back 1.5cm inwards at the under-bust level. I write -1.5cm in line 4 of column 7. Now that I have adjusted the side seam line of the back, I need to do the same with the front to even out their edges. There is 1cm difference between the adjustment values at the bust line level (-2.5cm) and the under-bust level (-1.5cm). If I want to shift the entire side seam line of the front 1cm inwards, then I need to shift it 1cm less at the under-bust level. As you can see, I don't need to shift the side seam line of the front at the under-bust level. I will shift it 1cm inwards at the levels of all other circumference lines. I write -1cm in the Adjusted Side Seam Front column (lines 3, 5, 6, and 7 of column 5) and a zero in line 4 of column 5. It's time to look at the changes in the princess seams. I need to double-check everything to make sure I have adjusted the standard pattern correctly and met my client's measurements. If I have failed to meet my client's measurement at the level of some or other circumference line, then I will need to find a suitable value for shifting the princess seams at the corresponding level. All changes in the princess seams are written under Princess Seams Back (column 8) and Princess Seams Front (column 9). I write dashes in lines 1 and 2 of column 9 keeping in mind that you are not supposed to apply changes to the front princess seams in the area above the waistline. I will use the values of the adjusted side seam configuration of the front and the back (columns 5 and 7). I start from the bust circumference. It is 86cm on the client and 95cm on the pattern. I have arrived at my client's measurement. It means I don't need to alter the back princess seam at the bust line level. I write a zero in line 3 of column 8. Under-bust circumference: it is 78cm on the client and 82cm on the pattern. Therefore I need to expand the pattern by 1cm at the under-bust level. I will use the princess seams of the back for this purpose. There are two princess seams (or darts) at the back of the dress and each one is made of two raw edges of fabric sewn together. In other words, there are four raw edges on the two pieces of the back, and I will divide this 1cm between them. I need to shift the princess seams of the back 0.3cm outwards at the under-bust level. I write 0.3cm in line 4 of column 8. Waist circumference: it is 68m on the client and 82cm on the pattern. Therefore I need to narrow the waist of the pattern by 5cm. I will use the front and the back princess seams for this purpose. There are two princess seams (or darts) at the front of the dress as well and each one is made of two edges sewn together. It means there are four raw edges on the two pieces of the front and four raw edges on the two pieces of the back, which makes a total of eight raw edges. I will divide this value of -5cm between them all. I need to shift the front and the back princess seams 0.6cm inwards at the waistline level. I write -0.6cm in line 5 of columns 8 and 9. Stomach circumference: It is 90cm on the client and 103cm on the pattern. Therefore, I need to reduce the pattern by 4cm in the stomach. I will do it with the help of the front and back princess seams by dividing the value of -4cm between their eight raw edges. I need to shift the front and the back princess seams 0.5cm inwards at the stomach level. I write -0.5cm in line 6 of columns 8 and 9. Hip circumference: it is 99cm on the client and 109cm on the pattern. As the result, I need to adjust the pattern down by 1cm in the hips. I will distribute the value between the front and the back princess seams. I need to shift the front and the back princess seams 0.1cm inwards at the hips level. I write -0.1cm in line 7 of columns 8 and 9. All calculations are done now and I can start customizing the pattern.